Don't have a milk glass collection? This gorgeous piece will make you want to start one! Vintage Fostoria "Winburn" lidded cracker jar. Pattern #1704 was first introduced in 1910 in crystal as the Rosby pattern. 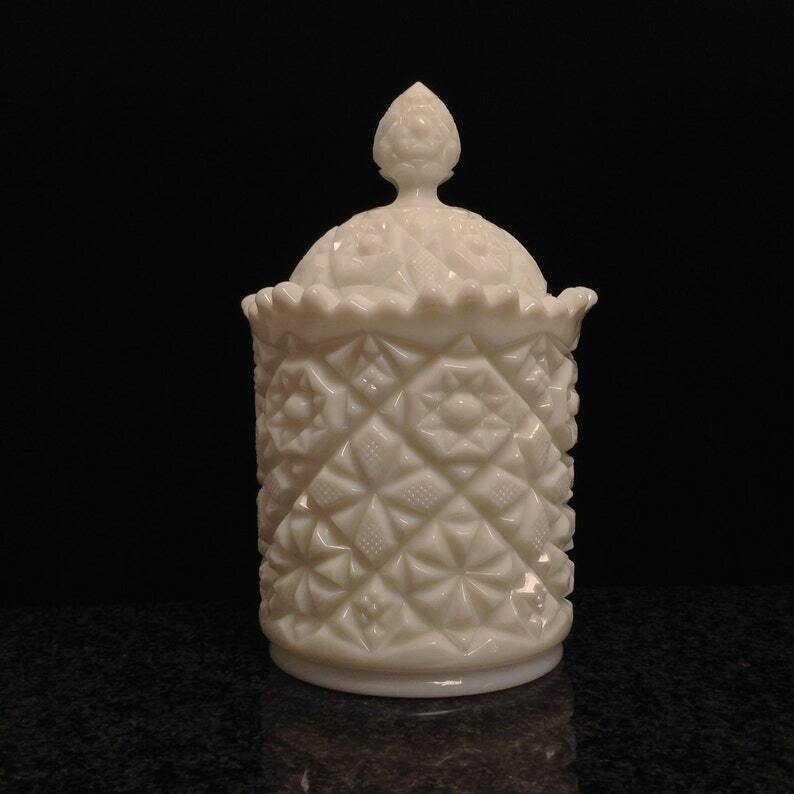 Fostoria later reintroduced the pattern in milk glass, naming this version, Winburn. The Fostoria Glass Company manufactured pressed, blown and hand-molded glassware and tableware for almost 100 years (1887-1986). Winburn was in production from 1954-1965 and came in a variety of pieces such as pitchers, tumblers, butter dishes, cruets, punch bowls, etc. This heavy and substantial lidded jar (the piece weighs just over four pounds) is molded with an intricate mass of hobstars and diamonds and finished with a flared, saw-tooth scalloped rim. The piece is unmarked and measures 9" tall with lid (jar measures 5 5/8" high alone) and 5 5/8" in diameter at mouth and 4 5/8" diameter at base. The lovely design continues on the bottom which causes the piece to rock slightly. Overall condition is excellent - pure white color with no chips, cracks or repairs. Two minor nicks on the rim edge of the lid (see photo three - lid at 3 and 5 o'clock).